It's practically mandatory in the New Orleans area that weddings have a second line of some sort at some point during the reception. 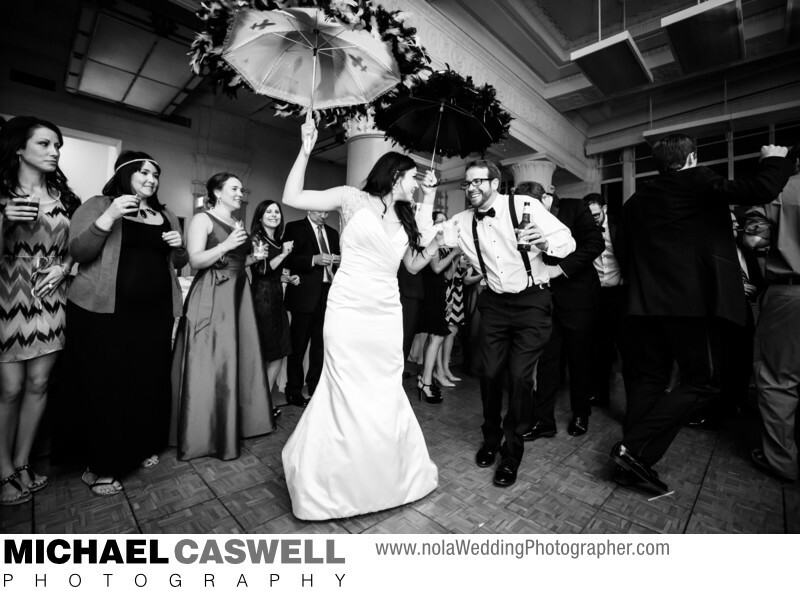 Sometimes it's a full-blown parade through the streets of the famous French Quarter led by a brass band, or as in this case, the bride and groom grab umbrellas and strut around the venue. Either way, the guests, especially those from out of town, absolutely love it! In this photograph, the bride and groom dance at the Federal Ballroom to the sounds of the legedary Topcats as guests look on. In keeping with tradition, guests can also wave napkins (or custom-printed handkerchiefs) around as they dance through the reception hall. Regardless, a second line parade is a great way to end a wedding reception in New Orleans! Location: 147 Carondelet St, New Orleans, LA 70130.